Native Media has been on the cutting edge of documenting contemporary Nigerian music and the culture that has grown around it. With print and online platforms and ‘NativeLand’, their annual offline concert that brings many of the rising stars in Nigeria and the UK to rave with thousands of young fans, the folks at Native Media have managed to create a progressive ecosystem that centres emerging music, documents how the music is influencing the cultures around it and vice-versa and acknowledges the power of the post-millennial generation. If there’s one theme that has played out extensively in Native Media’s documenting of the culture (and the larger industry if we are keeping a buck) is extensive referencing. The newer generation, while embracing contemporary sounds and production techniques, are also looking to the past and trying to reframe their youths and childhoods through the lens of nostalgia. 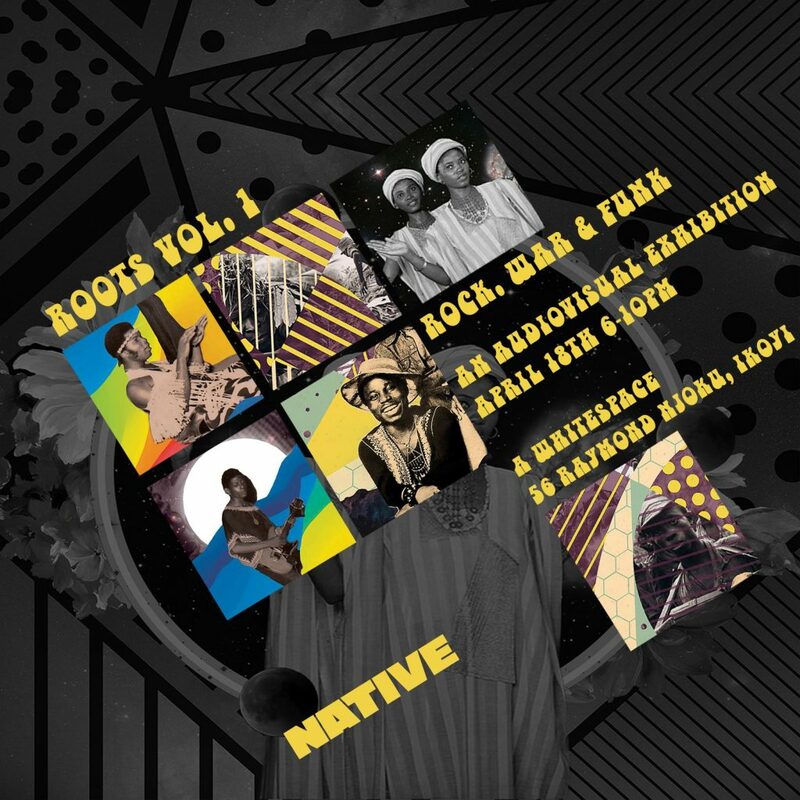 It explains the obsession with occultic material, driven by the occult lore of Nollywood in the 90’s, the ‘alte’ fashion, which references the punk era of the 80’s and the exaggerated silhouettes of the 90’s and the sounds that reference, extrapolate from and sometimes outright steal riffs, lyrics, and instrumentation from older artists. This is why it is fascinating that Native Media is curating the ROOTS: Rock, War and Funk exhibition. A proper primer into the music of the era and how politics, culture and ethnicity influenced the music of that era and how the idea of Nigerian born global superstar is nowhere near as novel as we have been led to believe by the Wizkid’s and Davidos. The Roots exhibition chronicles the biggest bands and groups of the 60’s and 70’s and explores the underlying political and cultural events that led to the growth of certain genres and their eventual demise. There is also a rumoured, accurate-to-the-era surprise that I am curious to see. It is somewhat ironic then, that with all the obsession around looking to the past for fashion, culture and musical inspiration, there isn’t that much inspiration to be had in the first place. With the exception of a handful of die-hard curators like Uchenna Ikonne, very little is known about the music scenes from the 60’s and 70’s. Very little visual footage survives that era, and even the music that persists today is owned by Western labels and sold as historical novelties rather than a contemporary force influencing a new generation of artists. And most surprising of all, it isn’t all about Fela. The exhibition opens, Thursday April 18 and runs through to April 22nd.